Ken Chua is currently chasing his dreams to make the world a better place through design by disabling disabilities. He is part of the pioneering undergraduate batch from Singapore University of Technology and Design. 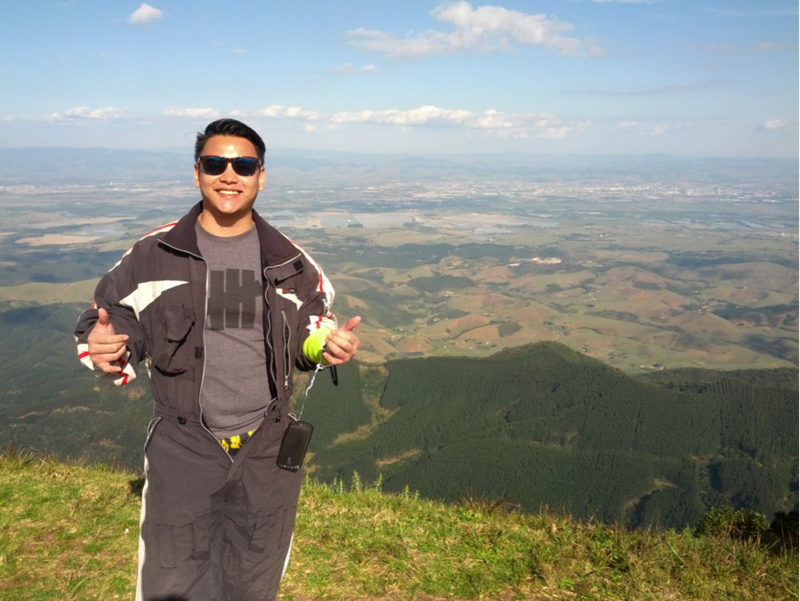 In June 2013, he made his way to Brazil to do a four-month internship with the world’s third largest aircraft manufacturer, Embraer, where he had the opportunity to put in features for those with physical disabilities, and hearing or visual impairments. We’re very interested in your internship in Brazil. How in the world did you land an internship with Embraer there? The opportunity arose due to a really strong interest from the distinguished ‘Embraer Professional Masters Programme’ in my university’s pedagogy. Embraer wanted to find out more about SUTD so, naturally, and after much discussion and liaison between the two parties, they brought 2 SUTD specimens out into the Brazilian wilderness to watch us in action, up close and personal. Fun fact: The last time Embraer had interns from overseas was about 17 years ago. So we were breaking new ground. How long did you intern at Embraer for? What were the working hours like? The internship was 16 weeks long. 8 weeks in Singapore, and 8 weeks in Brazil. Brazilians like to start work early, and end work early. So we were in the office by 7:30 am, and out the door by 4:30 pm. 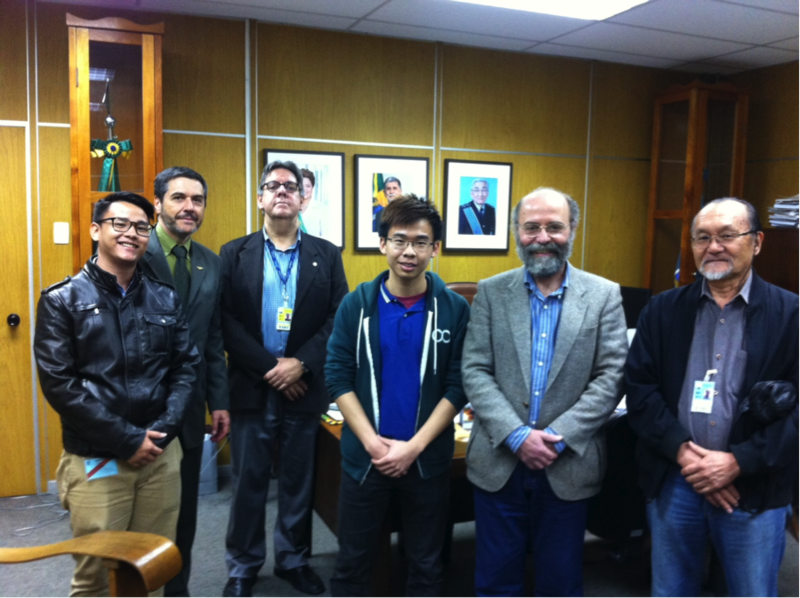 Very important people of Aviation Education in Brasil, in the office of the President of the Instituto Tecnológico de Aeronáutica. Tell us more about your time as interior designers for an aircraft. Was it a big project? Our entire internship was one massive, memorable project! My buddy and I were interior/product designers for commercial aircraft interior. 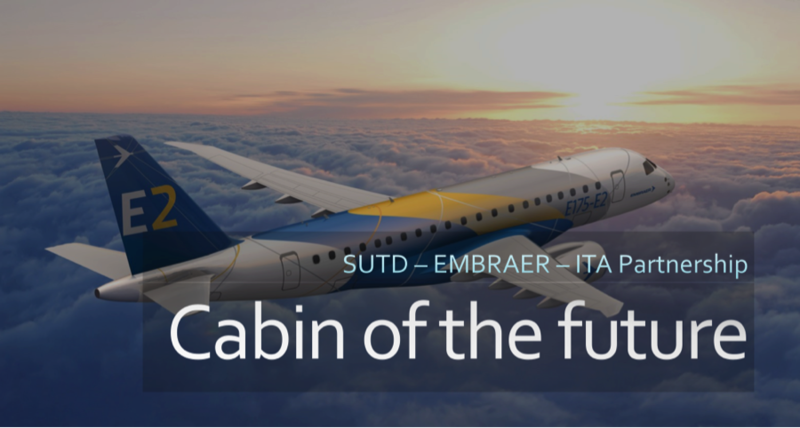 During our first briefing over Skype, Embraer showed us a video of Airbus’ futuristic concept plane for 2050, and had one simple instruction- to do better than Airbus. We replied them by sending this mock-up. We were Interior/Product designers specializing in cabin interior for commercial aircrafts in Embraer’s E-jet and E2 jet family. 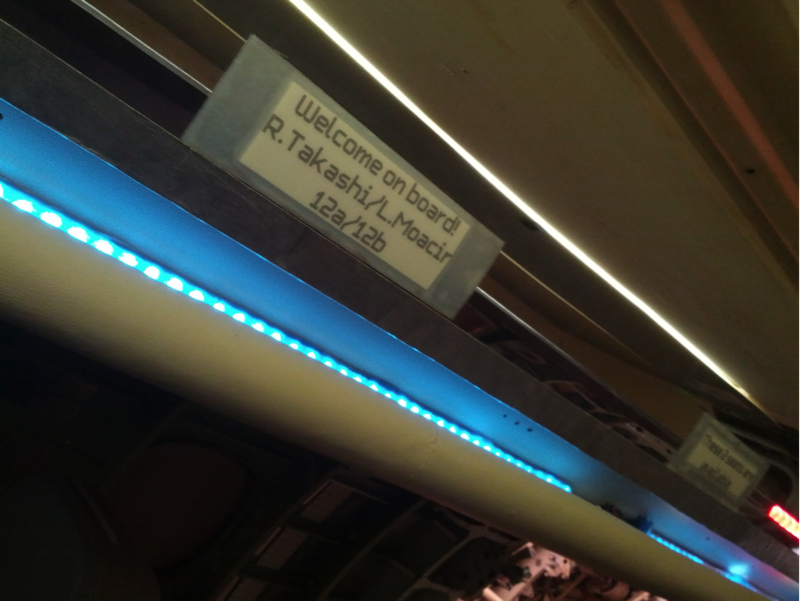 So, things like your seat, overhead storage, lighting and in-flight entertainment were areas of interest. From ideation, to deliberation and modification, to physically prototyping 1:1 scale models to retrofit into an actual life-sized cabin fuselage, we ran the entire mile. 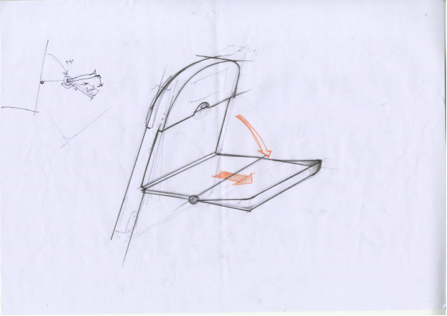 A simple sketch to accommodate personal electronic devices. 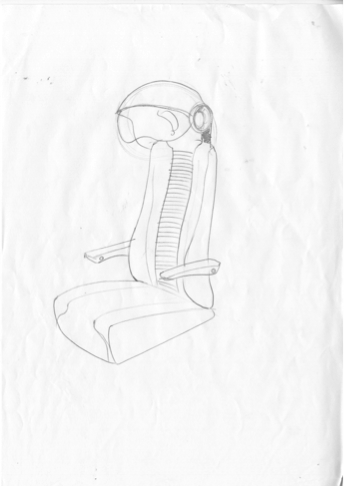 A futuristic seat design sketch, for Virtual and Augmented Reality integration. It was really interesting because at the end of it, we had a showcase in a hangar where many Embraer designers and engineers, university professors, and external design school representatives were invited to tour our various prototypes and ask us questions. They took us really seriously, even though we were still just interns. They held us in really high regard. One of the many physical prototypes we retrofitted into the life-sized cabin for our showcase. What is the working culture like in Brazil? 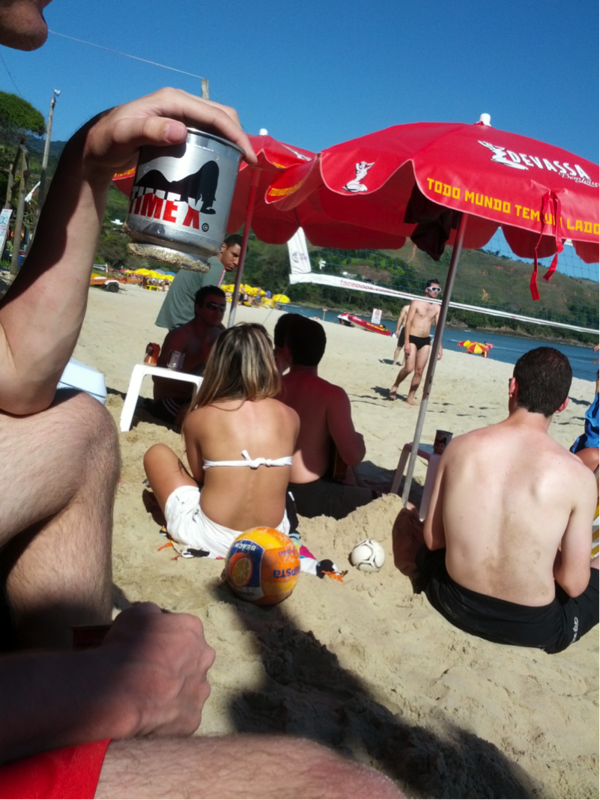 Brazilians have a really interesting approach to work. They place relaxation time in high regard, so no one takes away their prized coffee breaks during the day (i.e. they end meetings punctually, so that they can go for their regular 3:15pm trip to the cafeteria). However, despite spending so much time aside from work, they almost always get the job done on time. What were your colleagues like? We had a mix of designers and engineers in the office- a good blend of craziness and sanity. The ladies would be dancing and making Pão com Manteiga (Toast with butter) in the pantry in the morning, whilst the guys would be sharing about the parties they went to the previous night. What are the differences between working with Singaporeans and Brazilians? Oh, that’s simple. Singaporeans are too stressed out at work, and that blocks any creative flow in general. We are almost like machines over here. In Brazil, they take a chill pill and can get real creative anywhere, and at anytime. However, I feel that they could use a little bit of Singaporeans’ focus at work. It’s definitely a trade off! 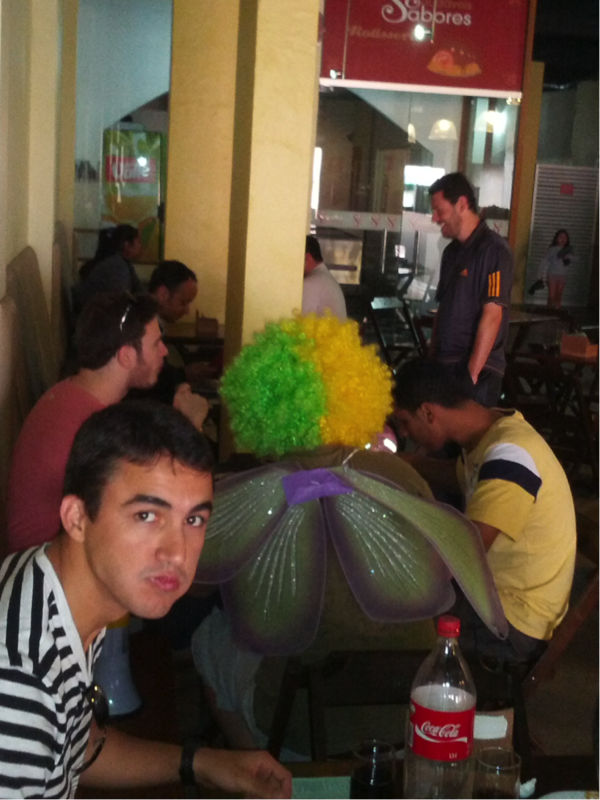 What have you learnt from working with Brazilians? I definitely left Embraer with the notion that you don’t work with colleagues, but you work with friends because when you start amalgamating work and life, the quality of both can improve tremendously. You are more comfortable to be yourself, and to do things in your own element, which more often than not produces better results. What should Singaporeans working in Brazil expect? 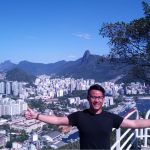 Singaporeans working in Brazil should expect to take a chill pill to cure that culture shock! After that, everything will be fine. 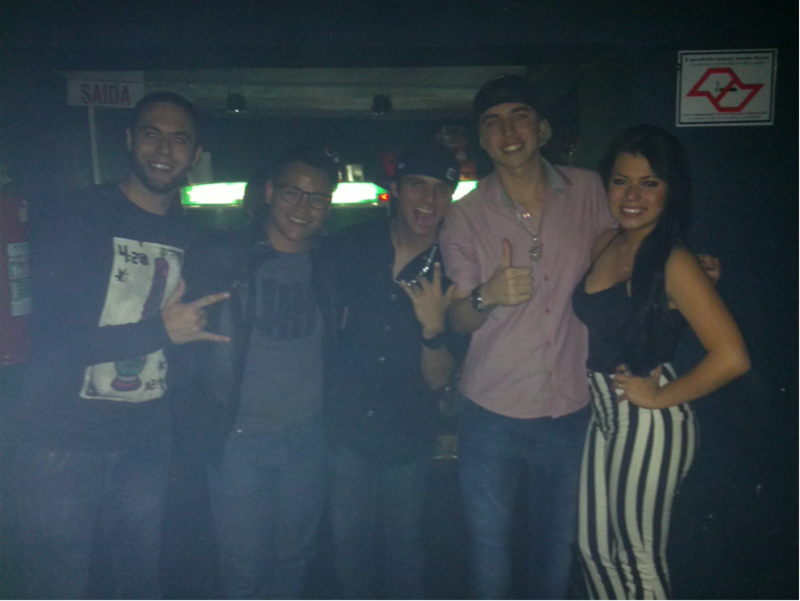 Brazilians make you feel at home. What were some of your perceptions of Brazil before your internship, and what surprised you most after? I expected to savor samba-spicy food everywhere. Being a chilli lover, I was astounded to find that no one in Brazil (apart from the northern regions) liked much chilli in their food. I had so much trouble finding spicy stuff in restaurants that I brought a bottle of hot sauce with me everywhere I went. Instead, Brazilians add lots of salt in their food, which can be quite overwhelming at times! I also expected Brazil to be a very dangerous place all around. However, everyone I met was really friendly, even thugs on the street at night asked me if I was having a good evening! At a Volcom Press Party, invited by friends I made in a skate shop in a shopping mall. These guys are considered the ‘bad guys’ that parents don’t want their kids around, but actually are really nice guys! The Big Brother of all skate shops in my city, Jereba and I. This guy gave me the keys to his motorcycle to tour the city, and even offered me protection against all thugs in his hood hahaha! How would you describe Brazil to a first-timer? 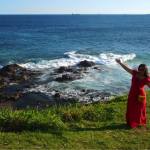 I would describe Brazil as a place with a lot of life, and friendly people who will take you in as one of their own, by inviting you to their intimate gatherings of barbeques and parties. 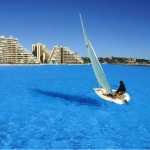 However, don’t expect much from what you see of Brazil on the outside. Most of the awesome Brazilian produce you hear of are always for exports which locals seldom get access to. Now that you are back in Singapore, what did you like most about life in Brazil and what do you miss most? There are many things I love and miss about Brazil! I shall list only a few to prevent this page from crashing. 1. Firstly, I like how everyone does things together. There is a communal spirit that cannot be matched. I definitely miss having barbeques where we feast on the best cuts of beef, frango e curação(chicken heart), and cinnamon roasted pineapple. No chicken wings or lousy artificial seafood sticks! I don’t have much pictures of the barbequed food because no one there understands the concept of foodstagram! Hot and tasty food goes straight into the mouth!! 2. I also miss going for parties with my Brazilian brothers, where Brazilian folk music is played(sertanejo, in particular where Brazilian folk music is played (sertanejo, in particular) instead of Electronic Dance Music, and where each party is treated as a game! We usually go in a large group of guys, with a team captain who plans our partying movements like a soccer game. Midfielders try to get us mingling with a group of girls, defenders check for ‘blindspots’ like whether a girl is single or not, whilst strikers do the finishing job of getting the girl’s number and a kiss, assisted by the traditional wingman. 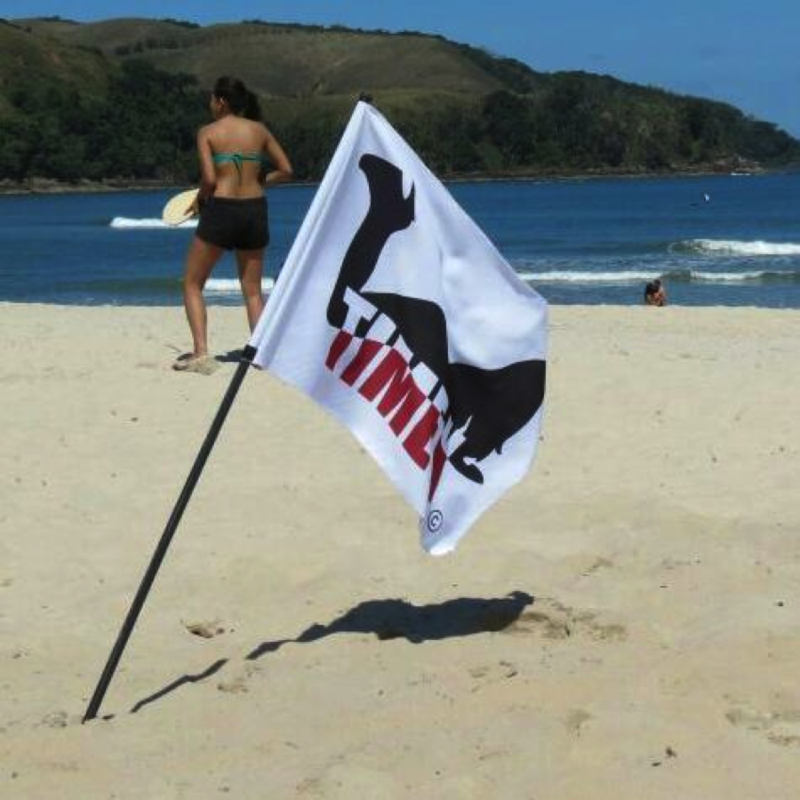 We even have a Team flag and merchandise! 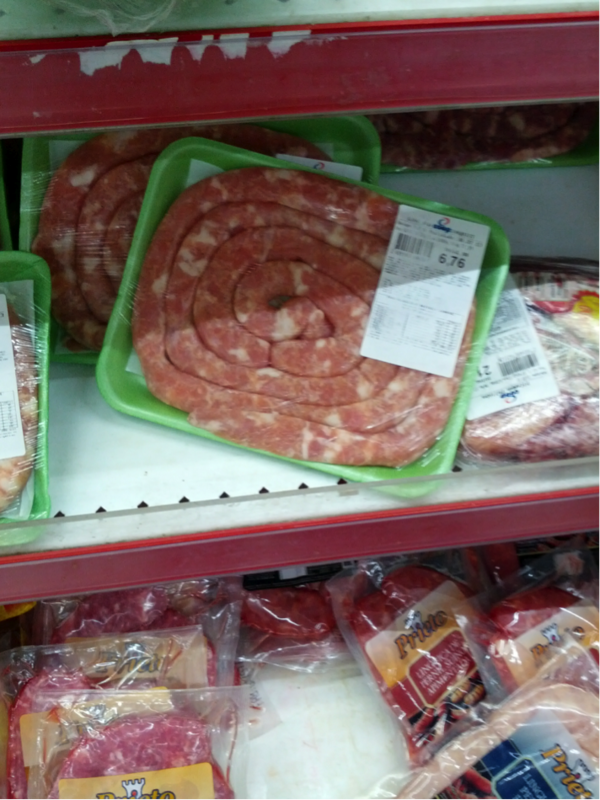 The price of this massive sausage is only SGD3.75! You cant even buy 3 chicken wings from Old Chang Kee for that price! There is also a lot of dancing at such parties, where the dancing is legit (no fist-pumping or girls ‘bouncing on the spot’ like in Singapore), and no one says no to an invitation for a dance! TImeX at Nicoloco, a 4000-strong “College students only” festival! 3. I really miss the beach life! Great water, great waves, and great babes. You sit on beach chairs under giant umbrellas whilst food vendors walk the stretch of sand to sell you food and drinks. They have the best iced lemon tea in the world, I must add! There are even ‘walking stalls’ along the beach selling bikinis that accept Visa! It looks like they walked right out of a Visa ad. The view of Maresias Beach, a semi-private beach which has an amazing nightlife as well! The guys dug a grave for our other Singaporean friend, Hu Yuan, to bury him hahaha! 4. 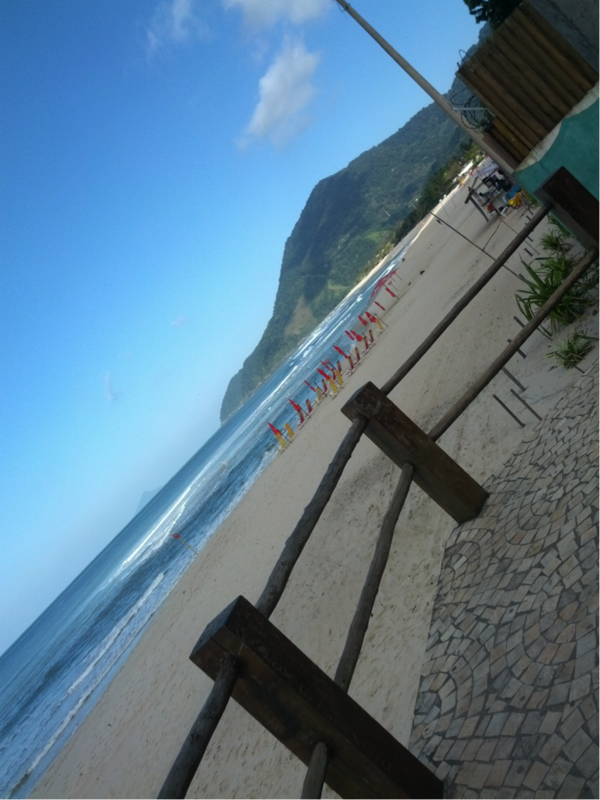 Lastly, I really miss the scenic view of various places in Brazil! Clear of all man-made structures, the skies are beautiful and pristine! 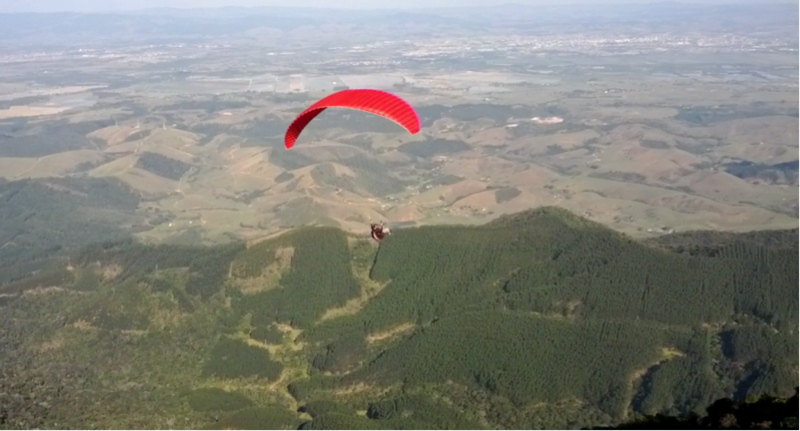 To take it all in, I paraglided down Peak Agudo in Campos do Jordão (a 2 hour drive from Sao Paulo), to be one with nature! The paraglider before me, mid-flight! The view is much better from where he is, trust me. 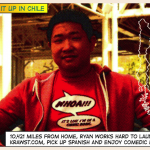 What were some of challenges that you had to work with when in Brazil, if any? The main challenge I had was with language. Not many locals speak English, and they don’t intend to. So pick up Portuguese or forget about getting what you want!! 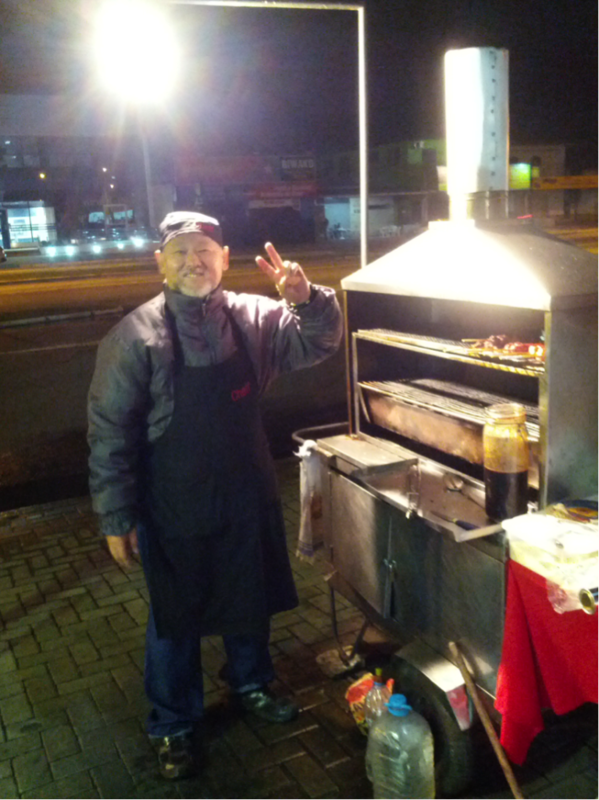 Senõr, as I call him, is my resident roadside churrasco guy! He does shrimp, lamb chops, teriyaki chicken, chicken heart, calabresa, melted cheese sticks, and even unagi on certain days! The best part about him was how he helped me learn Portugese. Because he speaks Japanese, he was my proxy in learning Portugese through Japanese! Transportation was another issue. We are blessed in Singapore to have our expansive transport network. 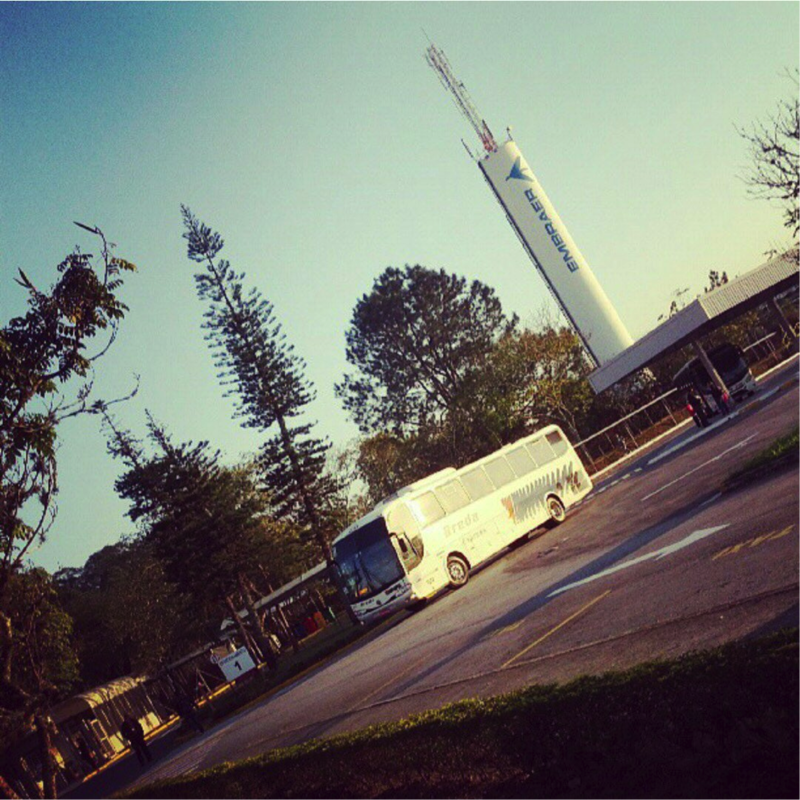 In less urban cities in Brazil, like Sao Jose Dos Campos where I was, getting from point A to B can be a pain with a lack of metro lines, and buses with misleading information coming at irregular intervals. 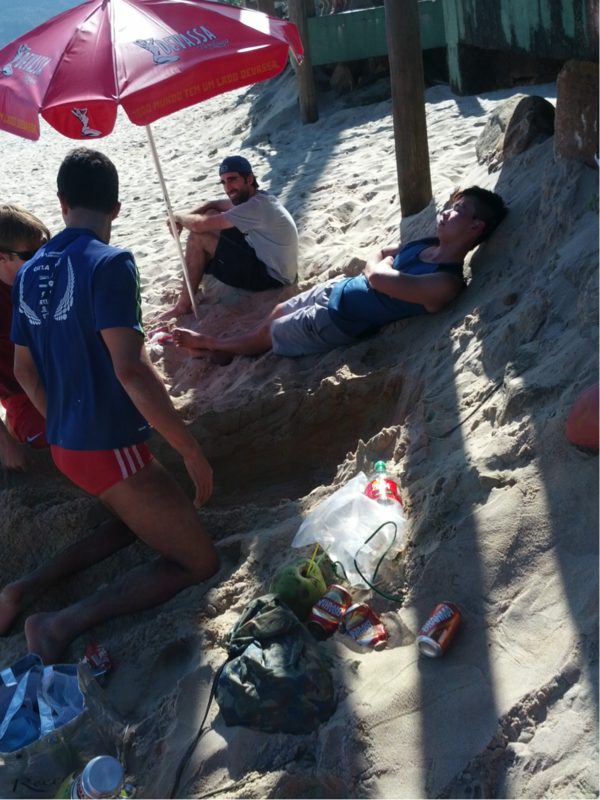 Editor's Note: Look forward to Ken's account of his weekend spent in Rio when we publish it next week. Working in a country is definitely a different experience compared to travelling in a country!